One of the investment strategies Alluvial Capital Management LLC offers is the “Global Quality & Income” portfolio, which seeks healthy current income and reasonable capital appreciation while taking on less risk than global equity markets. For the equity portion of this strategy I seek out companies with consistent free cash flows, little or no debt, and durable business models. I emphasize companies that can weather poor economic conditions better than more leveraged firms or those in cyclical industries. Additionally, I like companies that own unique and irreplaceable physical or intangible assets, since these often equal pricing power and limit competition. Examples include infrastructure like ports or highways, or respected consumer brands. These positive characteristics rarely come cheap. Companies with true durable earnings power and fortress balance sheets often sell at premiums to average market valuations, yet can still provide a means of earning satisfactory returns while avoiding a large part of the market’s risk and remaining insulated against volatile economic conditions. Jungfraubahn Holdings AG is an example of a company that meets all these conditions. 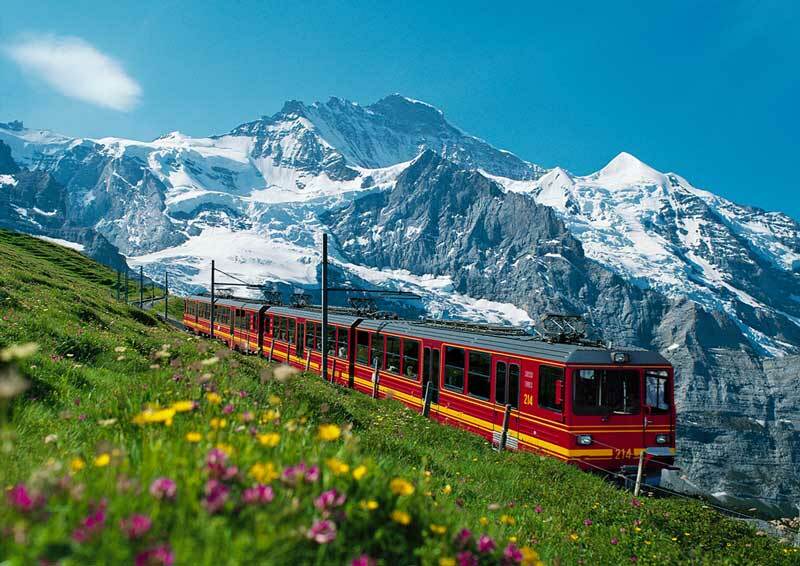 Jungfraubahn’s crown jewel is its railway system that transports tourists and vacationers high into the Swiss Alps, allowing them access incredible views and panoramas. Billing its highest station as the “Top of Europe,” Jungfraubahn seems to live up to its advertising and provide a great sightseeing experience, judging by the Tripadvisor reviews. The Jungfrau Railway was completed in 1912 and runs 5.7 miles to the peak, passing through 4.3 miles of mountain tunnel. 833,000 guests made the trip in 2012. Just to set the scene a little, here a picture of the railway and the scenery that riders experience. Sign me up! Revenues from the Jungfrau Railway and associated operations account for the lion’s share of Jungfraubahn’s profits, but the company also realizes significant revenues from multiple skiing and winter sports venues in the region. The company is working with other operators to expand its offerings, increase capacity and bring in more visitors during slower seasons. So, very pretty and clearly an attractive destination to many. But what exactly makes Jungfraubahn such a “quality” company? Gas station owners fret about another station opening up across the intersection. Clothing retailers expect their most popular designs to be copied almost instantly by other retailers. But if you own a railway in the Swiss Alps, you don’t exactly have to worry about another popping up the next ridge over and siphoning off one’s riders. For one, building a new railway anywhere requires massive upfront investment, extensive planning and years of construction. There are myriad other issues to deal with, including environmental impact studies and remediation, land and easement acquisition, governmental approvals and integration with existing transport networks. Nearly all of the developed world’s existing rail network was built decades and decades ago when these issues were much less significant. The Swiss Alps represent an especially challenging area for any possible passenger railway construction. For one, the supply of “views” is limited, and presumably the existing railway network already takes advantage of the most picturesque routes. Swiss national and regional governments also possess strong incentives to disallow new entrants, wishing to preserve the region’s unspoiled beauty and maintain the economic value of existing railways, some of which are party-owned by Swiss governments. Jungfraubahn’s railways occupy a unique competitive position and cannot easily be duplicated or copied. Through good economic times and bad, Jungfraubahn has produced remarkably consistent growth in revenues and profits. Even in the heart of the financial crisis, with the world economy threatening to collapse, Jungfraubahn’s revenues rose 1.8% in 2008 and declined just 0.3% in 2009. EBITDA and EBIT grew in each of those years, and have kept on doing so. As a well-known destination in a mature region, Jungfraubahn is not a fast grower. However, it has consistently increased its revenues and earnings for as far back as I can find records. From 2004 to the end of 2012, Jungfraubahn grew revenues at an annual rate of 4.1%, EBITDA at 6.1% and EBIT at 6.8%. Along the way, Jungfraubahn reduced its net debt from over 80 million CHF in 2004 to a net cash position in 2012. The company has reduced its leverage to the point that its capital structure is probably somewhat inefficient, but the conservative capital structure does provide benefits in the forms of optionality and reduced risk of financial distress. Jungfraubahn has plenty of capacity to take on debt if an attractive opportunity arises, and the low/negative debt standing makes the company nearly impervious to the state of the world’s capital markets, even if they were to grind to a halt. Jungfraubahn produces copious free cash flow and converts revenues to free cash flow at a high rate. Over the last five years, free cash flow generation has averaged 16.4% of revenues and 43.3% of EBITDA. The company has achieved this without sweating its fixed assets; capital expenditures averaged 113.5% of depreciation in the last five years. Jungfraubahn has used its steady free cash flow to pay down debt and pay increasing dividends. From 2004 to 2012, dividends rose at a healthy pace of 7.1% annually. Now that the company has paid down debt to a net cash position, it is free to devote a substantially greater portion of its free cash flows to productive expansion or payments to shareholders through dividends or buybacks. Together, these characteristics point to a company that is likely to maintain its market position for decades and decades to come, and can use its growing free cash flow to reward shareholders. At this point, let’s examine Jungfraubahn’s historical financial results. After all, this is a value investing blog. The results below are calculated from the company’s financial statements and are stated in millions CHF. Jungfraubahn has produced impressive results. Top-line growth has not been rapid, but it has been consistent, even through times of recession and economic stress. The company’s true accomplishment has been its expanding EBITDA and EBIT margins. In 2004, less than 18% of revenues dropped to EBIT. For the twelve trailing months, that figure broke above 22% for the first time. This increase can be explained partly by a slowly shifting revenue mix. Jungfraubahn has steadily increased the proportion of its revenue that comes from its hospitality and winter sports operations, which earn higher margins than its transportation businesses. If Jungfraubahn’s results show a glaring weakness, it is in returns on invested capital, which languish below 10%. Companies that require high levels of fixed asset investment often show low EBIT yields on invested capital, but Jungfraubahn’s anemic returns cannot be wholly excused. While not strictly comparable to tourist passenger railways, the three largest public US railways averaged 21.6% EBIT/invested capital in their most recent fiscal years. On the bright side, Jungfraubahn has succeeded in boosting returns on invested capital from a pitiful 5.60% in 2005 to 8.77% for the trailing twelve months. The 8.77% figure is still tepid, but results in significantly higher returns on capital provided. Jungfraubahn has also wisely refrained from employing additional capital in its low-return environment. Invested capital has remained nearly unchanged since 2004, though its composition has shifted strongly in favor of equity. If Jungfraubahn can continue to shift its revenues in favor of higher margin offerings, the resulting increase in returns on invested capital would greatly increase the value of the enterprise. Despite its high-quality operations, rock-solid balance sheet and consistent free cash flow, Jungfraubahn sells for a pedestrian 14.9x trailing earnings and around 11.0x EBIT for the entire enterprise. At the most recent trade of 67.50 CHF, the company offers a dividend yield of 2.7%. For the sake of brevity, I’ll forgo any detailed valuation exercise here. Suffice to say, purchasing high quality assets at undemanding valuations is very often a path to investing success. The biggest risk to Jungfraubahn’s results is the possibility of a serious slowdown in tourism activity in the Swiss Alps, or changing tastes in consumer travel. Jungfraubahn has been successful in attracting Asian clients, especially from China. Trouble in the Chinese economy could crimp the travel habits of China’s rich. A strengthening Swiss Franc could also reduce Switzerland’s attractiveness as a tourist destination. Jungfraubahn is not likely to double in value by next year, or rocket on news of some technological breakthrough. On the other hand, it is not likely to see its competitive position eroded through competition or see it shares plummet on default fears next time a recession comes calling. For investors interested in owning a unique business with strong defensive characteristics at a reasonable valuation, Jungfraubahn is worth a look. As a final note for anyone looking to take a Swiss vacation, Jungfraubahn offers a shareholders club for owners of 250 shares or more. Benefits of this club include half-priced train fare and free passes to winter sports venues. Could be a nice perk! Alluvial Capital Managment, LLC holds shares of Jungfraubahn Holdings AG for client accounts. Yes. Not going to make anybody rich overnight but the chances of earning a satisfactory return with little risk are very good. Do you suggest buying this on the grey market (JFBHF)? Or going directly to a broker with access to the Swiss exchange and buying JFN? Have there ever been cases where something on the grey market was not actually backed up by stock? This is something I have wondered about for a while. Any details you could share about how an unsponsored ADR type of stock works would be greatly appreciated! I’d recommend going direct. Interactive Brokers and Fidelity both provide access and I am sure others do as well. I don’t know of any cases where a grey market ADR wound up being fraudulent, but there is a real risk of being stuck with a completely unmarketable position. The Swiss stock is thinly-traded, but unlikely to freeze up completely like a grey market ADR could. They hаve locations іn LA and NYC. know any ways to help prevent content from being stolen? I’d definitely appreciate it. An obligation of appreciation is all together to post this information. I just need to reveal to you that I basically take a gander at your site and I feel that its charming and informative. I can barely wait to examine heaps of your posts.